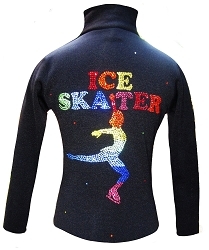 Rainbow Ice Skater Pants featuring 7 vibrant rhinestone colors and "Landing" skater position. Polartec fabric ideal for ice skating that demand freedom of movement, moisture management, and warmth. Enjoy skating and look great on the ice with premium ice skating jacket by Ice Fire - your way to shine!